Strategies for Portland carpet cleaning are as wide-ranging as the lifestyles of its homeowners. Some homeowners loathe spending money on a project they feel they can do themselves. Others welcome the convenience and the confidence that carpets are being properly cleaned with the expertise of a professional Portland carpet cleaner. Likewise, some carpets need to be cleaned two to four times a year in an uphill battle to combat pets, children, and the winter mush of foot traffic. Other carpets need only one annual cleaning. No matter how diligent a homeowner is asking guests to remove their shoes and avoiding other sources of carpeting filth, annual cleaning is still a must. Invisible dirt and grime contain edges sharp enough to cut fibers and shorten the life expectancy of your carpet. The most common form of carpet cleaning is steam cleaning. While this seemingly ubiquitous cleaning method will, indeed, clean your carpets, in the wrong hands it can lead to harmful side effects in your carpet. Inexpensive steam cleaners or poor application can leave your carpet saturated with moisture. Combined with an already moisture-laden air, drying times can easily lengthen to the point where mold and mildew, foul odors, or other carpet damage can be the result. Different carpet fibers are also more or less resistant to moisture, a factor that should be considered before any cleaning is started. 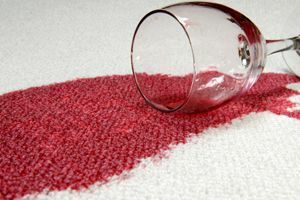 For this reason alone, you should at least be cautious about cleaning your own carpets. The time and money it requires to get your hands on the right equipment and learn to how use it, often leads homeowners to conclude it's simply easier to hire a professional. Of course, some homeowners also sway too far in the opposite direction and fail to adequately clean carpet all the way down to the bottom of carpet fibers. Alternately, homeowners can lose their motivation and gusto halfway through the project, opting to clean around furniture rather than move it. The average cost of carpet cleaning in Portland runs about $200, although we've seen recent projects cost as little as $50 and as much as $300. For multiple areas of exceedingly dirty carpet, costs of four and five hundred dollars are not unheard of. Although you may not realize it, there are actually several things you can do to reduce the cost of your carpet cleaning in Portland. First, talk to your neighbors about their carpeting. Often, you can receive substantial discounts if you can get one or more neighbors to hire a Portland carpet cleaner together. Since, many carpet cleaning projects take only 2-4 hours to complete and especially with the rising cost of gas, many professional cleaners will jump at the chance to bundle projects in this manner. On a smaller scale, your willingness and ability to move furniture can also influence the cost somewhat. You should also talk to your contractor about any carpet preparation, such as vacuuming or presoaking stains. Though it may feel like the cost of cleaning your carpet isn't worth it, having your carpet regularly cleaned can extend its life many years. Especially for high-end carpet that will be more expensive to replace and should last for ten years or more if it's cared for, you shouldn't neglect this important piece of your home maintenance schedule. Still, you can't expect to be satisfied with the final result and the final price without choosing the right person for the job. HomeAdvisor can help. Each and every contractor in our system has passed our rigorous ten-step screening process. You can also use quality-controlled customer ratings and reviews to see what other homeowners said about individual Portland carpet cleaners and tips for carpet cleaning in general. These reviews create a powerful incentive for contractors to meet and exceed your expectations for carpet cleaning in Portland. Comment: Two basement rooms and flight of 12 stairs. Comment: Need basement carpet and carpeted stairs cleaned. Comment: Tenants moved out, so I am looking for someone to steam clean the carpets on the 2nd floor. There are 2 bedrooms (approximately 300 sq. ft), a hallway and a set of carpeted stairs. There is a back unit with a single bedroom and carpeted stairs. Ideally work could happen on Friday 4/26. Comment: i have a rug that needs cleaning? Comment: Have a condo with carpeted bedroom. Needs to be cleaned for new renter. Have a rental house with carpeted staircase and hardwood floors throughout 1200 square foot house. Portland Carpet Cleaning Services are rated 4.93 out of 5 based on 463 reviews of 20 pros. Not Looking for Carpet & Upholstery Cleaning Contractors in Portland, OR?